YOU Magazine - April 2007 - Sharing the Gift of Time Subscribe to YOU Magazine and other timely market alerts from Laurie Gardner. "To the world, you may just be one person� but to one person, you might just be the world." It's a fairly straightforward idea. But it's easy to forget just how important we are to the people in our lives. So, in the spirit of understanding the impact we have on others, we would like to present a very special video. It may just change the way you think. At YOU Magazine, we're dedicated to providing information to help improve your life. Sometimes this information falls under the category of news. Other times, the information serves only as a gentle reminder of something you already know. "I once asked a five-year-old what he would take with him if he were going to Heaven. He replied, 'I would take my parents because I think that up there they would have more time with me'... nuff said." We decided to share this video in recognition of the importance of time, a commodity made even more precious because it's so fleeting. As soon as a day, an hour, or even a minute passes, it is gone forever. While this might be stating the obvious, consider it as a "gentle reminder" of something you already know. Something you may not know is that it's possible to slow time down, lengthening special events like a day of fishing with your child. The key is to consciously honor the moment as you experience it. In the video, the old man's son honored the day they'd spent together as it was happening. The father, on the other hand, could not say the same. By the time he appreciated the day with his child, it was too late. The moment was over. We encourage all of you to recognize the people you care about. You don't need to do or say anything specific, nor do you need to spend any money. You simply need to give them your time. More importantly, recognize the moments you share as being special. One thing's for sure–as soon as the moment passes, it's never coming back. 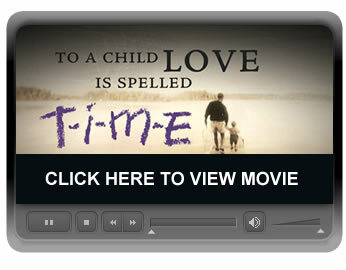 YOU Magazine is pleased to present To a Child, Love is Spelled T-I-M-E, a short film produced by Simple Truths, a consumer-direct publisher of motivational books and films. Visit www.simpletruths.com to learn more about this unique company.